It may be a bit strange when a Leo dating a Virgo get into a romantic relationship together, but as time goes on the relationship will start to feel more natural. These zodiac signs have many differences, some might say that they are nearly opposites. However, both of these signs are guided by strong driving forces. They are both ambitious and determined to get what they want. These two signs can learn to respect each other even though they have their differences. In the Leo and Virgo compatibility, they will both need to put in a lot of effort into their relationship if they are to make it work. Leo sun sign is often associated with the proud lion, as it ought to be. This sign has a large ego and they know it. This sign is a determined and ambitious one. They are a natural-born leader. They hate any job where they have to take orders from someone else. Because of this they will work their hardest to make their way up the job ladder until they get into a position of power. The Leo star sign is also a great communicator, which is one skill that can help them to advance more easily than some of the other signs can. This sign isn’t just out for him or herself though; they also make great friends. They are encouraging and supportive, as they know how it feels to have a goal that doesn’t have support, and they won’t want to have their friends feel that way. Also, the Leo man or Leo woman knows that it’s good to have friends in high places. Virgo zodiac is an independent sign. Like Leo, this sign knows what they want, and they won’t let anything get in the way of their goals. Virgo is a complicated sign, as they have many conflicting goals. They want to be as organized as possible, reach a high level in their career, and they usually want to raise a family. Many people only try to do one or two of these things. Virgo is truly magnificent, as they somehow manage to do all three of these things. While being so busy and having so many other things to worry about, this sign can be perceived as being high-strung, nervous or anxious by others and even him or herself. Virgo men an Virgo women are regularly plagued with anxiety. When looking for a romantic partner this sign will want to be with someone supportive and who has traditional family values. Leo will have to work hard to be able to fit both of these criteria. 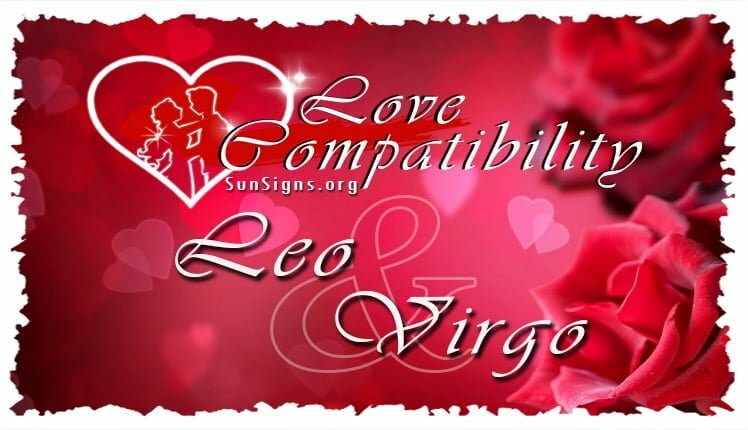 While the Leo Virgo love compatibility has many differences, it also has some strong similarities that can help to bring this couple closer together. Let’s look at some of the pros of a Leo-Virgo relationship. These two are bound to have an easy time talking to each other, while also having conversations that they actually care about as well. Virgo men and women happen to be rather intelligent most of the time, so they able to captivate the Leo mind with new knowledge which they may have ever heard about before. Leo loves learning new things, especially things that will help them to advance. At the same time, Leo birthday people have some creative ideas that aren’t too off the wall so that they will still interest and entertain Virgo, as the Virgin is not usually interested in abstract or imaginary ideas. Leo also loves to be the center of attention in their relationship, and the Virgo’s loving nature has no problem with acknowledging that fact. Virgo likes to do the important background work and let their partner remain away. They just feel more comfortable that way. In the Leo and Virgo compatibility, the lion also loves getting compliments, and Virgo has no problem when it comes to letting their partner know how much they care for as well as admire them. Virgo is a sort of perfectionist, and they are attracted to people with the same sort of aura around them. While Leo is not a perfectionist, they like to act like they are when they are around people who they want to impress. This could be why it is usually a Leo who attracts the Virgo and not the other way around. Virgo is usually shy in nature, at least when they first meet someone, and especially when they meet someone who they are attracted to. Virgo also want to be with someone who is stable financially as well as in the rest of their life. Leo does not fake that aspect of their life. Their constant drive to succeed in their business and personal life help to lead to stability in both areas that Virgo is interested in. Virgo will not make Leo do all of the work though, as they often have jobs that required close attention to detail and that pay well for it. Just as well, Virgo will enjoy spending time with their children if Leo does want to do all of the work for the family. As well as it may seem these Leo Virgo soul mates get along with each other, all couples have their disputes. Let’s look at some of the cons when it comes to a Leo and a Virgo in love. While the similarities between these signs help to bring them together, their differences could be what drives them apart. While Virgo does understand that it is important to be stable, as that is one thing that they strive for in a relationship, but at the same time, they do want the finer things in life. It makes sense, if you have excess money should be able to spend it, at least, that’s how Virgo feels. Leo doesn’t feel this way though. They would rather save their hard-earned money in case something bad happened instead of spending it on something fun. Virgo personality finds this trait to be both stingy as well as boring. At times Leo’s social life will upset Virgo, as they think that it is more important to be at home with their children, rather than being with friends. Leo thinks that making connections is at least equally important, as they can see their children whenever they want. But an opportunity to meet with someone who may be able to advance them in their career could easily pass them by if they don’t take it. While Virgo respects that the Leo’s career is important to them, they still think that they should spend more time at home with their family. Sometimes in a Leo Virgo marriage the lion will want to spend time with their family, but they will also want to be in charge of their family. This is something that Virgo will not want to tolerate. Virgo understands that Leo is smart and stable enough to lead their family, but they will still want an equal say in what goes on in their family. This sounds reasonable to most people, but Leo is willing to fight for power in the relationship, even if it leads to more arguments in their relationship. This commanding trait is one of the biggest things that causes problems in Leo compatibility with most signs. Leo also tries to be creative and romantic at times, but they tend to be inopportune times for Virgo. Virgo sometimes gets upset that Leo is wasting time on a large romantic gesture when they could easily do something more practical with their time and money. Leo could see this Virgo compatibility simply being no fun. This could make the Lions feel bad about their romantic attempts, and this may lead them to trying less every time they want to do something special for their Virgo partner. Overall, the Leo Virgo love compatibility can work if these signs can learn to play to each other’s strengths, as well as compromising when it comes to their differences and weaknesses. The Leo Virgo marriage compatibility won’t be easy, but if both signs can put in their fair share of effort then it will be worth it. While this relationship will have its ups and downs, all relationships do. So long as these two can love and respect each other this relationship should work out.